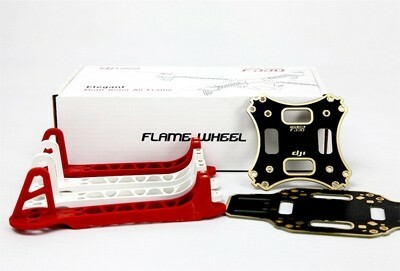 DJI F330 Flame Wheel multi-rotor QuadCopter frame ARTF kit is designed for all pilots for fun or with the use of an autopilot. The F330 Flame Wheel can be used with the NAZA autopilot systems to achieve hovering, cruising, even rolling and other flight elements. It can be used for entertainment, FPV flights and other aero modelling activities. Please note: this is the F330 Flame Wheel ARTF Kit comes with a set of matched motors, props & ESC's, you will still need to add a flight controller to this setup. Please visit the DJI NAZA F330 Flame Wheel Kit page for the ARTF kit with Flight Controller.